Even if you have time for only one or two poses per day, you will experience benefits. Maintain conscious breathing. Breathe through each pose calmly and mindfully. Come to class to learn more about yoga breathing! Remember to stay hydrated, and listen to your body’s messages. If something doesn’t feel right, then simply back off. You are the expert on how you are feeling. If you have pain, dizziness, nausea, or other symptoms at any time, discontinue, rest, and drink water. 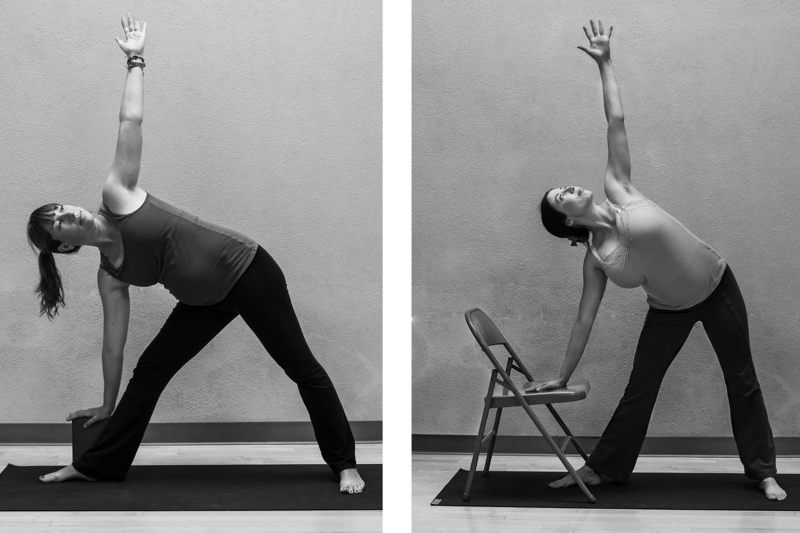 Apply yogic body, mind, and breath options throughout your day while pregnant. When you are in labor you will be familiar and comfortable with the holistic support yoga can provide. Disclaimer: Please note that Yoga is not a substitute for medical attention, diagnosis, or treatment. Always consult your medical or other health professional before starting any movement program. Please note that the creators of this material are not liable for any ill effects or injury from the practice. This sequence brings flexibility to the hips and pelvic floor, as well as relief to tight shoulders due to everyday stresses and carrying increased body weight. Note: If it is difficult or impractical to sit on the floor, the shoulder openers can be practiced standing or sitting on a chair. Match soles of feet together in bound angle. Gently “fludder” the hips; the knees will move up and down, observe the increased mobility at the hip joint. Sit on a blanket or pillow to keep knees at or below waist and protect the lower back. Hold a yoga strap, bathrobe sash, or men’s tie. Start with the strap at approximately waist height, gently grasping it wider than your shoulders. Breathing in, circle it up and over the head and breathing out reverse direction. Everyone’s range of motion will be different. You can sit or stand. Elbow circles. Bring fingertips to shoulders and begin drawing circles in the air with your elbows. Start with small circles and then increase range of motion (ROM). Standing poses build physical strength and confidence. Two variations of triangle pose are featured. Women in their last trimester particularly might find the chair version as their best option. Align front and back heels so hips feel spacious. Keep chest open to allow full breath. Stay strong in legs and feet, especially back heel. Use block or chair as needed ; repeat on both sides. Can take warrior II, reverse and side angle with same leg position. I often hear audible sighs of relief and release in my classes due to the breathing space created by gate pose. Align standing knee and arch of outstretched leg. Use blanket to pad knees if desired. Keep both sides of waist long; the direction of stretch is lateral. Enjoy the breathing space for 3-5 breaths and repeat on other side. Notice the shin and ankle alignment. This places the pelvis in a healthier position for yoga squat. Squat benefits are many. They include helping to strengthen upper legs, relieving back tension, enhancing pelvic floor health, and can relieve constipation in some women. Can help prepare for labor. Exercise caution in last trimester if baby is in breech position. Chair version is typically preferred. Use wall or chair for support as needed. Can sit on blocks at wall so spine doesn’t round. Perform pelvic floor lifts or squeezes to check muscle tone. Play with various arm and hand positions. Take time to savor quiet, relax, and restore. There will be natural pauses in labor. Practice abiding in the lulls and refreshing your being. Practice breathing and simply being. For more information or to experience Yoga with Bonnie, you can contact her office at (520) 870-9287.